Way back when, I picked up a book that changed my life. 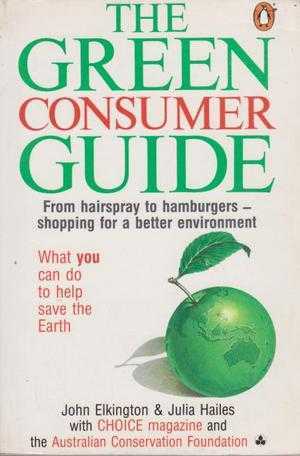 I think the year was 1989 or 1990 and the book was The Green Consumer Guide by John Elkington & Julia Hailes. In collaboration with the Australian Conservation Foundation and CHOICE magazine, the UK pair had tweeked their best-selling book for an Australian audience. At the time I was deeply concerned about the hole developing in the ozone layer and the greenhouse effect. I was keen to reduce my CFC use, to do my bit and make a difference. This book gave me lots of good tips and suggestions. The amount of highlighting in the book is testament to all the sections I thought were important to remember. I was starting out on my adult life and I wanted to make good choices not just for me but for future me and any future family I might have. And because I was young and idealistic, I also wanted to make good choices for the future of our planet. I bought white goods, furniture and appliances over the years, based on the principles espoused by the authors. I took out a CHOICE membership so I could keep up to date & I always made purchases based on their eco-friendly ratings. I used green cleaning methods and tried companion planting to keep the bugs at bay. I put a lead weight into my toilet cistern and converted to cruelty free cosmetics. I walked to work most days and gave out Wilderness Society calendars at Christmas time. So imagine my disappointment over the years to discover that things were getting worse for our planet. Perhaps not as quickly as first predicted or as dire, which maybe meant that all our little efforts were helping after all. If only our governments and big business weren't so determined to ignore, deny and continue on with their make-more-money-at-all-costs attitudes. And now, suddenly, it's 30 years later, and we have scientists talking about critical tipping points and points of no return. For us and for our planet. 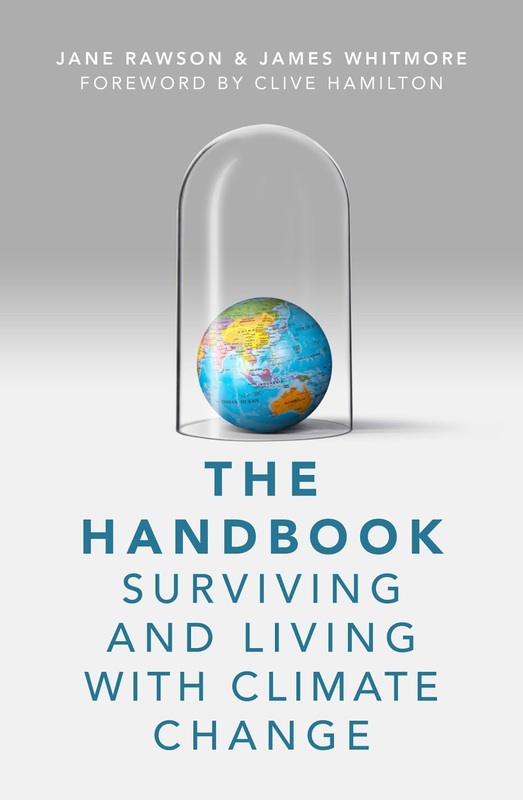 To help us prepare for the new environmental challenges ahead of us, Rawson & Whitmore have written a modern how-to guide for survival - The Handbook. If you're new to the whole self-sufficiency approach or want to do something practical but don't know what that is, this book will do for you what The Green Consumer Guide did for me. It's full of useful information about how to flood and fire proof your home, emergency survival tips, self-sufficiency ideas and lifestyle choices that can make a difference. It's very specific and practical. 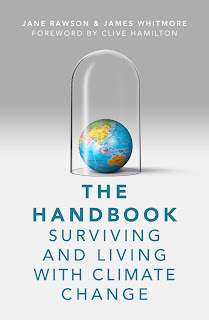 But most importantly, it discusses the psychological impact of climate change and how we can prepare our minds for the changing times ahead. If, like me, you've been reading and doing stuff like this for years, many of the ideas here will not be new to you. But it's a great refresher course with up-to-date statistics and scientific thinking. It's also great to be reminded that we can do something, we can be pro-active. It's not just endless, seemingly fruitless talks at world conferences or famous folk jumping on bandwagons. There are things we can do. We don't have to wait. They might be small things, but if enough of us do these small things every day, then perhaps we can slow the bigger changes down. Finally, one of the interesting passages near the back of The Handbook discusses how hot our planet is getting and how hot it will get in the future. 2014 was the world's hottest year since humans started keeping records. 14 of the 15 have happened in this century. In Australia, 2014 was our third hottest year; 2013 was our hottest. Seven of Australia's ten hottest years have occurred in the past 13 years, with only 2011 cooler than the 1961-1990 average. Like many of you, I have said things like "oh this summer is not as hot as the ones I remember when I was a kid" or "it's not that bad, we've had hotter summers and survived." The summer's weren't as hot back then. The stats clearly say so. In the 16 years of this new century, 14 of those years have been the hottest on record. Time to get real; time to get practical. I have read this review 3 times. How can I help the our planet? Your book review has at least made me think more about my 'small contribution' ! It can be very easy to feel overwhelmed when you hear about how quickly warming has accelerated just this century. And to get furious at our govts & big business for not only ignoring but actually increasing the problem. To keep me sane, I just keep plugging away at my little bit. It's all I can do.